Step 2 – Contact eSight for import / error locations on the server, and populate the form shown below with these locations. Also configure the allowable duplicates and allowable errors and other fields as per the screenshot below. Step 3 – Click “Add” to show the following form. 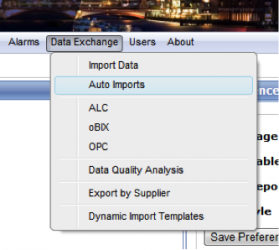 Configure the Auto import CSV Location as provided by eSight. Configure the other items as per the screenshot below. Click “Save” to add the new auto import. Data will be imported every minute (unless there is a backlog of data). If the “Overwrite” checkbox above is ticked, and data already exists for a particular meter and time stamp, it will be overwritten. Step 2 – Select “CSV via FTP” as the data export type, and also select a data export interval and max data points per export (more information on these parameters can be found in the “Data Export” section of this document). Step 3 – Fill in the FTP server settings that have been provided by eSight in the “CSV via FTP” section as per the screenshot below. The FTP timeout can be left at the default value of 3000 milliseconds. Assuming the gateway has an internet connection and can communicate with the eSight FTP server over the relevant port, and also that there are nodes joined to the gateway that have data export enabled, data will be pushed to eSight. The final step on configuring the eSight interface is to add a meter to eSight for auto import. This requires at least one sensor on the gateway to have data export enabled. Step 2 – Note the Export ID, units and reporting interval for this sensor. If it is not already selected, ensure that the checkbox for “Export Enabled” is checked. Note: If a faulty meter is being replaced, you may want to change the Export ID from the default value to match a value that has already been configured in eSight. Step 3 – Login to eSight as an administrator and navigate to Configuration > Configure Tree, from the main menu. Step 4 – Select the appropriate site from the tree view, and click the “Add Meter” link on the right. A screenshot of the add meter page is shown below. 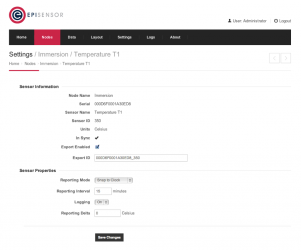 This form should be populated with the information relating to the sensor that was shown on the “sensor settings” page on the gateway. The yellow fields are required, and the “Import Code” field will also be required in this case. Meter Name A friendly name for the data source – for clarity it should be configured up with the same name as on the Gateway. 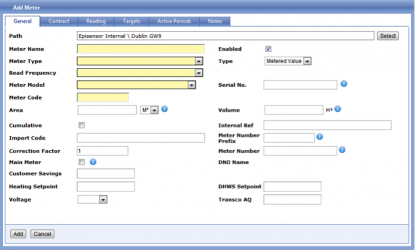 Read Frequency Enter the “Reporting Interval” parameter from the sensor on Gateway. If the value is not in this list, it can be added from the Configuration > Read Frequency page. Import Code Should be set to the “Export ID” as defined on the Gateway sensor settings page. Note: If using the ZEM-6x electricity monitor, the max kWh value for the ZEM-6x is 21,474,836 kWh. eSight should be configured to compensate for this threshold being crossed. This can be configured in the ‘Meter Types’ section of eSight. Submit the form, and data will start being processed by eSight as it is regularly exported from the Gateway.